For many agricultural producers, crop insurance is an important risk management tool. To better understand how crop insurance can provide an economic backstop to unforeseen agricultural losses, we offer the following overview. Crop insurance policies are issued by private insurance companies and sold by licensed local agents. There are two main types of insurance for farmers: crop hail insurance and multi-peril crop insurance. Crop hail insurance is limited to losses due to hail and/or fire. Multi-peril crop insurance (MPCI) provides extensive coverage for losses from weather to pests and even loss of revenue. In many cases, multi-peril policies are subsidized and backed by a federal reinsurance program. Crop hail coverage comes in several different forms and can be added as a rider to a MPCI policy. The extent of coverage depends on the type of crop insured. A crop hail policy may also provide coverage for losses caused by fire, lightning, wind (when accompanied by hail or when added as an endorsement to a policy), vandalism or malicious mischief. Coverage for the crops during transportation and storage may also be available. Crop hail coverage is sold by private insurers and regulated by the state insurance departments. It is not part of a federal government program. There is a federal program providing a variety of multi-peril crop insurance products. The Federal Crop Insurance program was created in 1938. Today the RMA administers the program, which provided policies for more than 255 million acres of land in 2010. Insurance companies selling MPCI coverage must be licensed by the RMA. Sales Closing Date – All crop insurance applications for the designated county and crop are due by this date. Final Planting Date – Crop must be planted by this date; a penalty is placed on the amount of coverage for each day late. Acreage Reporting Date – Acreage report includes a list of crops planted, number of acres planted (each crop), and share of crop (if ownership is shared). End of Insurance Date – Crop is no longer covered after this date; losses must be reported before this date. Crop insurance applications are very detailed and must be filled out completely and accurately to ensure correct coverage. Because a MPCI policy is subsidized and reinsured by the federal government, any inconsistency with information filed with other agencies (such as the Farm Services Agency) could result in a denial of claim. When filling out an application, expect to have to choose an insurance plan type, coverage and price levels, and a unit structure. Insurance Plan Type – A basic crop insurance policy is called catastrophic (CAT) coverage. Premiums for these policies are completely subsidized by the federal government; the farmer is only responsible for an administrative fee. Coverage by this basic policy provides 50/55 coverage – or claim payment on losses in excess of 50% of normal yield, equal to 55% of the estimated market price of the crop. Coverage is assessed based on the farmer's actual production history (APH). CAT coverage may not be available for all types of crops. Provisions beyond the basic CAT policy are considered “buy up” coverage. In addition to increasing the standard CAT percentages for additional catastrophic coverage, a farmer can buy up protection against wider yield or revenue losses. 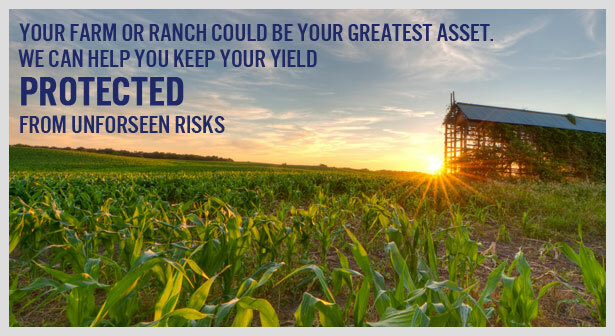 Yield insurance protects against production losses and can include coverage for losses due to natural causes, declining value due to yield shortfall and even losses based on county averages instead of individual production history. Revenue insurance protects against lost revenue caused by declines in yields or prices. These products combine production guarantees with a price guarantee to create a target revenue guarantee. In 2011, the RMA combined its most often selected revenue products into a single Common Crop Insurance Policy (COMBO). This policy combines Crop Revenue Coverage, Revenue Assurance, Income Protection and Indexed Income Protection into a single uniform policy. RMA also developed a single rating and pricing component so all insurance coverage is consistent in protection and cost to farmers of the most popular crops. A list of the crops eligible for the COMBO policy can be found on the RMA website. Crop policies are highly adaptable by a wide range of policy endorsements and other options that a licensed insurance agent can help farmers understand. Coverage and Price Levels – These two levels help determine premium and are used to determine a guarantee per acre. Coverage levels vary by plan type, but typically begin at around 50% and increase in 5% increments. A farmer's APH multiplied by the level equals the policy guarantee or coverage. For revenue plans, farmers can also select a production price level which determines the guarantee as revenue. APH multiplied by selected price equals your revenue guarantee. Generally, higher coverage levels result in higher guarantees and higher premiums. Unit Structures – This selection determines how the crops on a farm are parceled out for the purpose of the insurance coverage. There are four types of units: optional, basic, enterprise and whole-farm. Optional units cover production by serial number and require a farmer to keep production separate. Basic units insure production by crop, county (or parish) and entity/share. Enterprise units combine all acres of one crop – corn, for example – for a county into one policy. Whole farm units combine all acres of all insured crops in a county into one policy. Insurable interest in the proposed crops is determined with an acreage report included with the application. The report must include the total acreage, the percentage ownership shares, the name of all landowners and the plant date. High-risk acres should also be identified. Discrepancies on an acreage report can result in a “Misreported Information Factor,” which decreases the amount of an indemnity should a claim occur. There are many variables that can trigger a claim on a crop insurance policy from adverse conditions that prohibit a farmer from planting to damaging weather that eradicates part of the yield. When a crop is damaged by a covered peril, it is the farmer's responsibility to notify their insurance agent or broker. Do not destroy or replant before a crop insurance adjuster has surveyed the damage. At Alliance, we take the time to understand your needs and goals. We then customize an insurance plan with several options that will give you the protection you need. To speak with a risk advisor today, simply fill out the form below and we will reach out to you shortly!